As part of the Online IamInfoSMART Project, the Libraries conducted a video contest from 13 August to 30 September 2014. This activity aims to solicit ideas from library patrons themselves by actively engaging them in the development of short video tutorials on information literacy skills. The Libraries is pleased to invite the community to the second session of the Human Library on 18 November 2014 (Tuesday), 10:00am to 12:00nn at The Learning Commons, 12th floor, Henry Sy, Sr. Hall. Mr. Macon Phillips, a coordinator from the Bureau of International Information Programs (IIP), based in Washington, DC, visited the American Corner-Manila on October 22, 2014 for a round table discussion with members of YSEALI (Young Southeast Asian Leaders Initiative) in the Philippines. As part of the IamInfoSMART campaign, the Libraries will be having a week-long IamInfoSMART Multimedia Exhibit with the theme “Activate The Learners! : Empowering InfoSMART Lasallians Through Engagement” on 10-14 November 2014, 8:00AM - 5:00PM, at the Exhibit Area of The Learning Commons, 6F Henry Sy, Sr. Hall. It is a week-long fair of exhibitions, learning sessions, and interactive games, which are all aimed at engaging student participation. IamInfoSMART aims at honing students to become information literate (IL) by equipping them with the necessary IL skills and raising their awareness on the importance of IL in their pursuit for academic and research excellence. 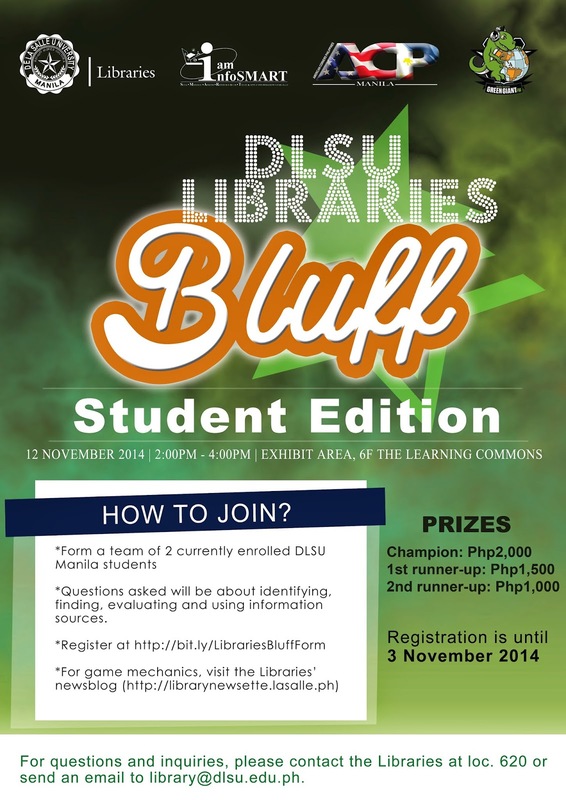 As part of the IamInfoSMART campaign, the Libraries will hold the DLSU Libraries Bluff on 12 November 2014 (Wednesday), 2:00-4:00PM at the Exhibit Area of The Learning Commons, 6F Henry Sy, Sr. Hall. The DLSU Libraries Bluff (based on the TV game show Celebrity Bluff) is open to all bona-fide DLSU undergraduate students. During the contest, each team will answer five (5) questions (10 points each) related to criteria for evaluating information sources. The host will pick a bluffer for each question. The host will read each question once which is projected in the screen. After reading each question, the library bluffers will either help or trick the contestants by providing answers to the questions. Each team has to decide whether library bluffer’s answer is a fact or a bluff. The bluffers may give a brief explanation of their answers. In celebration of the Library and Information Services (LIS) month this November, the Libraries will be running an Information Literacy (IL) Campaign called IamInfoSMART with the theme “Activate The Learners! : Empowering InfoSMART Lasallians Through Engagement” on 10-14 November 2014. 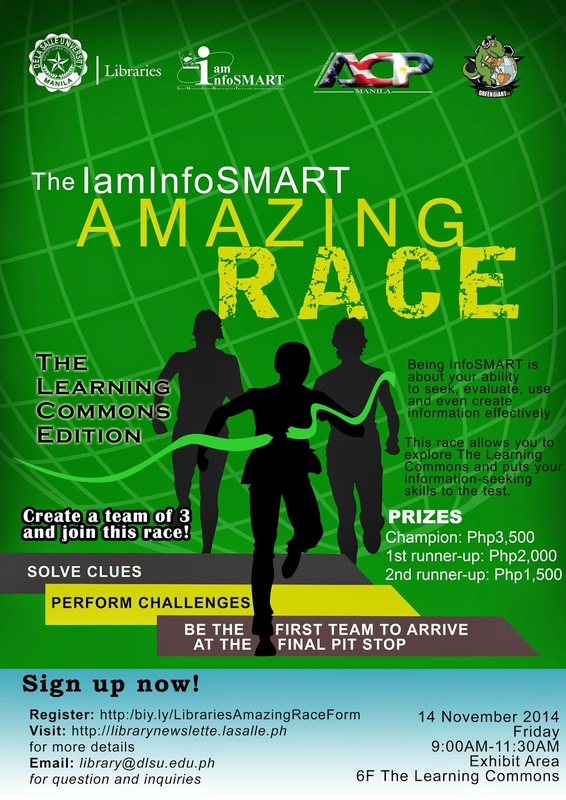 More information about IamInfoSMART and other upcoming events will be posted here and Facebook account.